Located Danbury, CT and just minutes from Ridgefield, Bethel, New Fairfield, Brookfield, Newtown, and Brewster, NY our school offers piano lessons for students of all ages and abilities from beginners to very advanced. 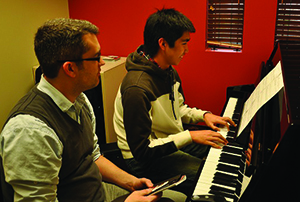 We offer every style of piano lessons from classical to jazz and pop. We have students who want to play just for fun as well as students who enter competitions and go on to collegiate music programs. Since we have so many piano teachers on staff we are able to match students with an instructor who works best for their particular age, ability and interests. We start piano lessons for students age 5 and older. (Note: 4 year old students may be enrolled in our Suzuki method private piano lessons. Space in this program is limited. See below for details.). 30 minute weekly lessons are recommended for most beginning students, though many of our adult students prefer to take 45 or 60 minute lessons. Longer lessons are also available for students who are advancing and would benefit from more time with their teacher each week. Parents are always more than welcome to sit in on their child’s lessons. For our advanced students we have teachers with master’s degrees in piano who can prepare them for university entrance and competitions. Contact Us Now for More Information.